A day in Capri can be beautiful any time of the year. Learn what you can see on a day trip to this lovely island off the coast of Naples, Italy. The island of Capri, located in the Tyrrhenian Sea on the southern edge of the Gulf of Naples, has been a popular vacation resort since Roman times! The remains of ancient villas speak to this noteworthy history, and today the island is extremely popular with Italian and foreign tourists alike. 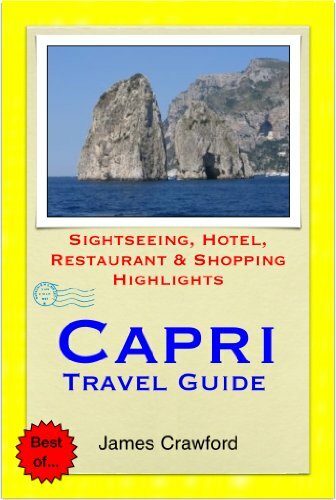 While the summer months are the most popular for visiting the island of Capri, there is still much to see and do if you are there during the wintertime. Some popular attractions such as the Blue Grotto are much less crowded in the winter, and you can also enjoy the magnificent landscape and historical sites no matter what time of year. 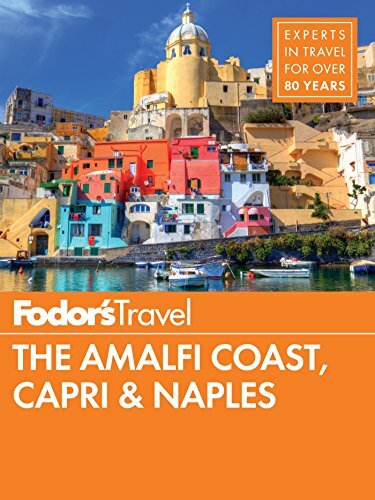 While it might not be worth spending a lengthy vacation there in the wintertime, it can make for a fun day trip from Naples or Sorrento. All photographs on this page are by the author, sockii, unless provided by Amazon. 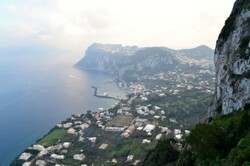 See my complete Capri photoset at Flickr! Obviously you will need to take a boat to get to Capri; there is no airport on the island. If you are staying in Naples or Sorrento there is quick ferry or hydrofoil service from both cities year-round; you can get current schedules and connection information at Capri.net (and even download a schedule app for your smartphone!) In the high season there are also ferry boats connecting Capri to Amalfi, Positano, and Salerno. We took the hydrofoil from Naples which took about 40 minutes each way and was an easy, pleasant ride. You may want to buy your return ticket in advance, so that you know you have a seat - the evening boats can sell out in high season! We left for Capri from Naples at 9:30am and were at Marina Grande just a little past 10. Marina Grande on Capri on a Winter morning. Touristy? Yes. But a very unique experience. One of the major attractions on the island of Capri is The Blue Grotto (Grotta Azzurra), a sea cave along the coast known for the brilliant blue of the water inside. In the summer season going to the Blue Grotto can take hours, whether by boat or by bus, for the less than 5-minute experience of taking a rowboat into the Grotto. But in the wintertime there are far fewer tourists and it took us only one hour from getting off the hydrofoil at Marina Grande. We chose to take the boat, the fastest way from the Marina to the Grotto. It makes for a dramatic ride partway along the coastline of the island. There, rowboat captains await to take you three per boat through the small cave opening. On this winter morning there were only three rowboats waiting; in season you can expect a traffic jam of them, and even boats trying to sell you souvenirs on this already pricey experience! It costs 12.50 Euro per person for the rowboat ride, and 9 Euro for the boat ride there from the Marina and back, so if you’re trying to do Capri on a budget, you might want to skip the Grotto. The day we went, the color of the water was not quite as vibrant blue that morning as it sometimes can be, due to the partly overcast sky that day. However it was still fun and I’m glad we did it on such a quiet day instead of with hundreds of other tourists waiting. It’s worth noting that if the water is too rough or too high there will be no access to the Grotto, so you may get there and be disappointed. We were on a boat to the Blue Grotto by 10:30am, and back from the journey and in the Marina once again by 11:45am. What's it like taking a rowboat into the Blue Grotto? 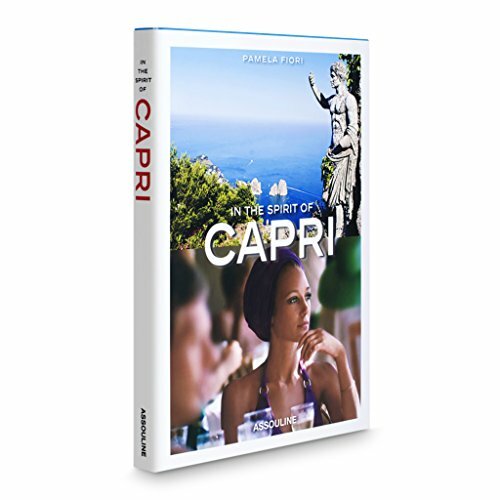 Next to: Capri, or Anacapri? 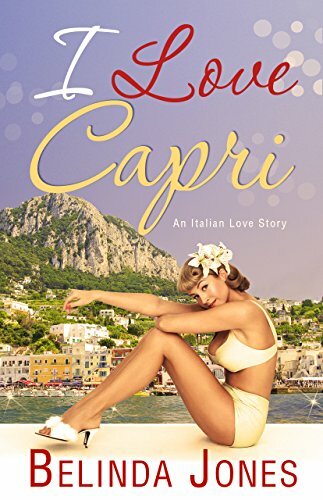 There are two main towns on the island of Capri: its namesake, Capri town, and Anacapri. 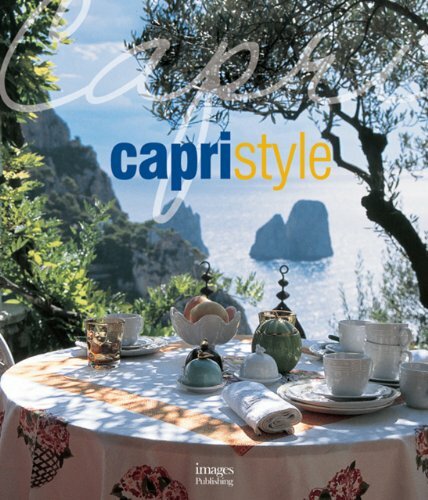 Capri town, just above the Marina Grande, is where you will find most of the luxury hotels, shops and cafes. If you are interested in seeing the ruins of Villa Jovis, you will need to head to Capri town and then hike from there; it is about a 45 minute – hour walk, depending on your physical fitness. However if you are a fan of Roman ruins you may want to make the effort as it is the largest of twelve Tiberian villas believed to have been built on Capri. When we arrived in January on the island and talked to a taxi driver, he suggested we might better enjoy a visit to Anacapri at this time of the year than Capri town for a day trip. Anacapri is a little quieter but is where you will find the beautiful Villa San Michele as well as some artistic shops for ceramics, limoncello and art which are open year-round. Now, perhaps he only wanted to get the extra 5 Euros for the trip to Anacapri, but we decided this wasn’t a bad idea-while I wanted to see Villa Jovis perhaps, on a cloudy day with limited time, Anacapri might be a better choice for the day. Walking along a quiet path in Anacapri toward the Villa San Michele. In winter many of the shops on Capri are closed for the season. The drive to Anacapri from Marina Grande takes you up very winding roads offering scenic views of the water and island below. We were dropped off in the center of town, from which it is easy to then head either to Villa San Michele or into the center of “historic” Anacapri. We started with the Villa. Along the way we only passed a few shops open, one selling limoncello-related products where we enjoyed some free samples and bought a small selection of goodies to take home. Another was a ceramics shop which dangerously (for me) had beautiful pieces at discounted prices for off season. I ended up purchasing a beautiful centerpiece serving tray to be shipped home! The artistry was lovely and the price was right. Travel off-season and you will find the shops in many towns eager to cut you a good deal on merchandise. The incredible serving platter I purchased in Capri...now at home in my dining room. Heading toward Villa San Michele in Anacapri. 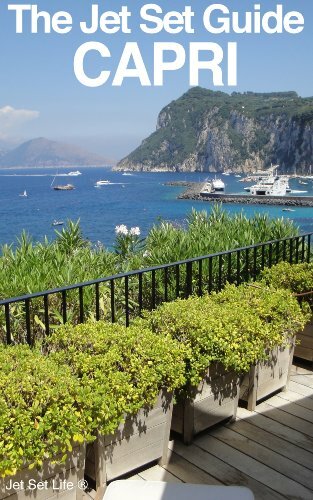 One destination that is worth your time on Capri no matter what the season is the Villa San Michele. It’s a very short (no more than 10 minutes) walk from the center of Anacapri. The villa was built by the Swedish physician and writer Axel Munthe, on the ruins of an ancient villa of the Roman emperor Tiberius. As such, the house and gardens are decorated with Roman antiquities as well as curiosities from Egypt and elsewhere. You can tour the villa itself, which has seen many famous visitors, and take in the breathtaking views of the harbor from the lush gardens. 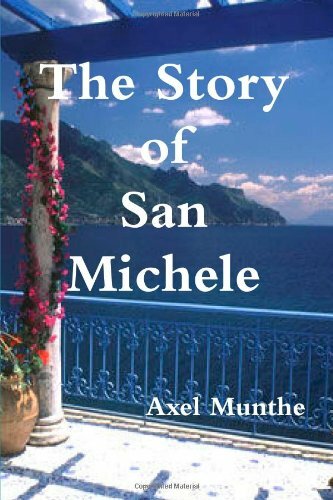 It was about 2pm when we finished at San Michele and headed back toward Anacapri town for a late lunch. The famous enigma of the Sphinx of San Michele. Citrus trees laden with fruit in the gardens of Villa San Michele. Learn how physician Axel Munthe came to love Capri, and to complete his dream project of building the Villa that still draws so many visitors today. This popular book has been translated into more than 30 languages and is a delightful story full of memorable characters and adventures. We were booked to return to Naples on the 6:30pm hydrofoil that night-the last boat back to the city. So we had about 4 hours left to spend on Capri, with our first priority being finding somewhere open for lunch! Not many restaurants in Anacapri seemed to be open off-season; in fact the only place we did find serving lunch was Ristorante Barbarossa, right on the main piazza where our taxi driver had dropped us off. We enjoyed an acceptable meal of pizza and salad that was mostly noteworthy for being quite pricey (like everything else on Capri). It was now heading on past 3:30pm and we decided to simply walk about the rest of Anacapri for the afternoon, although perhaps we would have found more open if we’d gone to Capri town instead? No matter, Anacapri was quite lovely to explore, even if most of the shops were closed. We did find an artist in his studio whom we spoke with for some time about the island as well as his work. Painted ceramics were on display throughout the town, from shop windows and signs to the churches and even the public benches! Capri has several beautiful churches which are well-worth visiting year round. Capri is known for its ceramic arts...even on public benches! We returned by taxi to Marina Grande at just about 6pm to make sure we wouldn’t miss the hydrofoil back to Naples. With a little time to kill we walked along the waterfront until they began boarding the boat…whereupon I immediately fell asleep for the entire journey back to the mainland! I guess all the sea air had worn me out. All in all it was a relaxing-if pricey-way to spend a day getting away from the noise and bustle of Napoli. There were many things we did not have the time to do on Capri which we’ll have to go back for someday: the Faraglioni rocks, the Vila Jovis, the entire town of Capri itself! But it was enough in one day to at least get a taste of the island and its unique charm. Perhaps next time I would at least stay overnight if possible in order to see more and do some hiking, or try to make it on an earlier boat to be there first thing in the morning to maximize our time there. The hydrofoil that gets you to and from Capri.